Carolyn graduated from UBC in 1993 with a Bachelor of Science degree in Physical Therapy. Shortly after graduating she relocated to Florida where she worked with clients with neurological impairments including stroke, head injury, MS, Parkinson’s, and Guillan Barre and clients with a variety of musculoskeletal injuries. 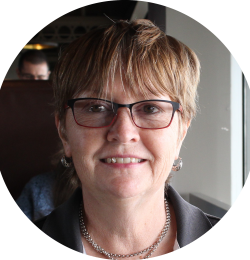 While in the USA, Carolyn expanded her knowledge by attending post graduate courses in physiotherapy and it was there that her special interest in vestibular rehabilitation began. On return to British Columbia in 1998, Carolyn and her husband ran Parksville Physiotherapy Clinic. During the past twenty years she assessed and treated clients with neurological and musculoskeletal clients, and also continued to expand her assessment and treatment of vestibular disorders including vestibular neuritis, labyrinthitis, Meniere’s disease, benign paroxysmal positional vertigo (BPPV), migraine associated vertigo, cervical vertigo and postural instability. Carolyn is excited to bring her experience treating vestibular disorders to Advanced Health and Sports Clinic. If you are experiencing dizziness, imbalance, or vertigo, book an assessment with Carolyn today.